The last thing I want to do is drag myself out from under the warm blanket, in my warm house, to venture out into the cold and the rain. 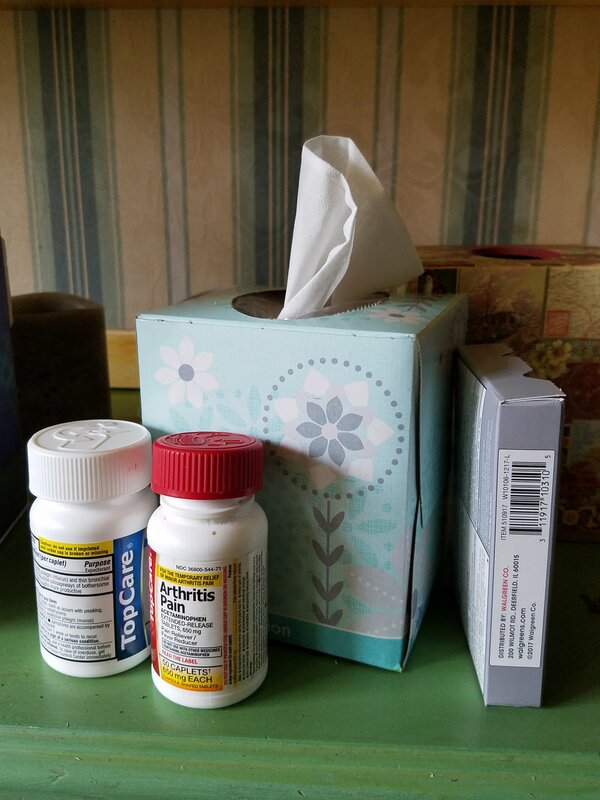 It has been over a week, and four tissue boxes, and I am tired of struggling to breathe. Just standing up can be enough to make me want to sit back down again. But, there are numerous beings outside who rely upon us for their food and water – so, out I must go. It was easier when this bug began. My mother could take care of all of the necessary chores, as she usually does on workday morning. But the bug has now caught her, so our little menagerie must rely on two sick humans for their needs. To get through it, we mostly split the chores – me for the horses, and she for the smaller critters. The property is mucky, so time out for horses has been limited. I fully expect to enter a chaotic barn, and the thought exhausts me further. Instead, all eyes are soft, and they are on me. Between illness and travel, I have been somewhat absent, and apparently I was missed. Each face gestures to me in an effort to be noticed. I visit each with a face rub or neck scratch, based upon each horse’s preference. Hay is distributed, and all is peaceful munching. Well, not quite. I turn and Noble is watching me. He bobs his nose in my direction, and I am compelled to go and visit. We are often told that all horses care about is food, friends, and freedom. 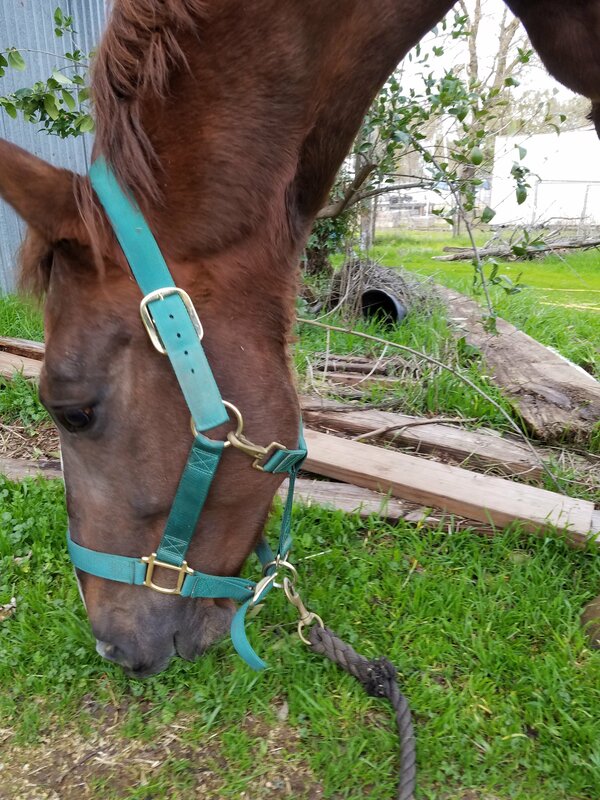 He is foregoing the first and last, by choice; and though many horse training gurus will tell you otherwise, the only conclusion is that I fit into the middle category. It is hard to resist those soft eyes focused fully on me. I rub his forehead – something that would have been unthinkable even a year ago. He is becoming increasingly peaceful to be around, and my absence this week seems to have made him all the happier just to be near me. I am exhausted from my efforts, yet soothed by this quiet moment of just being together. I give him one last scratch and head down the aisle. Tally is there to greet me, as I reach her stall. Also more interested in attention than food, she places her forehead against my chest, and I give her neck a rub. My soul happy, but my legs weakening, I make my way out of the barn and trudge toward the house. As I do, two conflicting notions dance about in my head. The first is that standard phrase I learned when I was a child – the horse’s needs always come before your own. The second is familiar to anyone who flies – place your own oxygen mask on before assisting anyone else. It can be difficult, in these times, to balance the need to provide for these animals, for whom we have responsibility and control, with the need to safeguard ourselves. Stalls may get dirty, but horses will survive that. If I get pneumonia (as I have several times in my life), then more vital things will be at risk. I reach the back door, and I hear Noble call. The guilt grows. “Later!” I call back. “I hope,” I mutter to myself. Later, the afternoon is now sunny, the wind subsided. I have a bit more energy, so I decide to fulfill my promise to Noble. There is lingering doubt about taking him out. Due to the mud, he has voluntarily spent a couple of days indoors. He may be big, but he’s a wimp when it comes to wet feet! Not long ago, the idea of taking him out when he’d had no outlet for his energy would have been a non-starter. But he has been improving, so I take a chance. He’s a bit snorty going out, but settles nicely to grazing. Never mind that he could graze anywhere in the back, at any time, if he’d get over his thing about mud! But he is content, and it is very pleasant just listening to his munching, and smelling that sweet aroma of torn grass. For a while I forget about my wheezing chest and pathetic lack of stamina. I’m aware only of the massive warm body standing next to me, and how different it feels to be next to him, these days. I return Noble to his stall, and this time it’s Roxie who leaves her meal to demand my attention. She rests her muzzle on my shoulder and snuffles in my ear, while I give her face a rub. I curse the weakness, as I long to spend more time with the horses. But I realize it is once again time to take a rest before the next round of caretaking chores. Feeling like a marathon runner who’s hit the wall, I trudge my way back to the house – weak in body, but enriched in spirit. 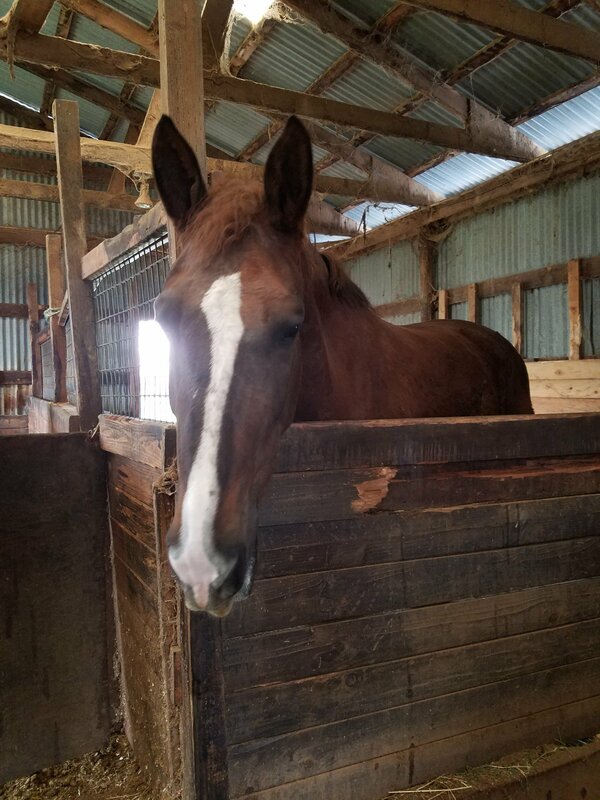 This entry was posted in My Journey and tagged home horsekeeping, horsekeeping, Noble, Roxie, Tally. Bookmark the permalink.